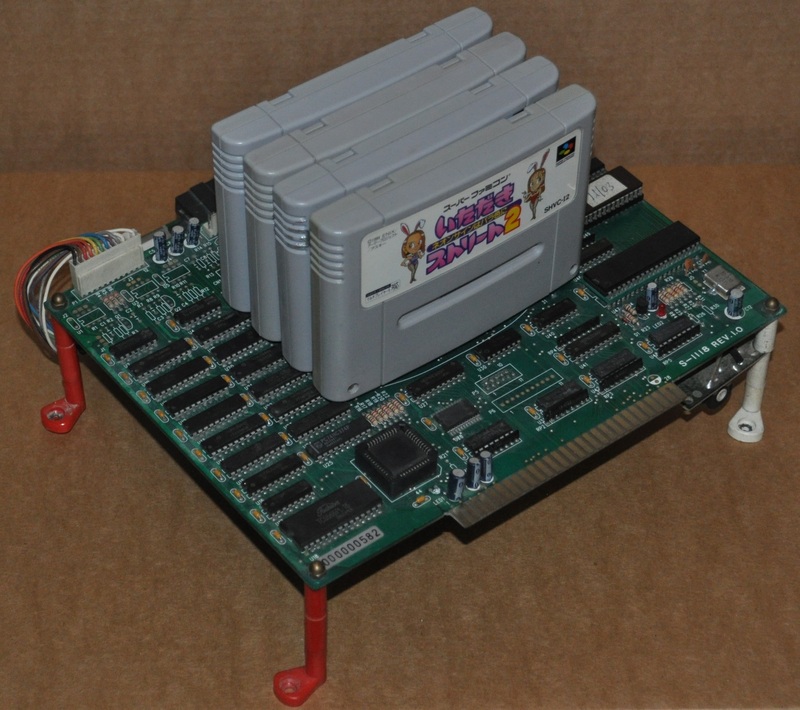 So what this system does, is allow you to run SNES games in an arcade cabinet with credit based or time based play. It knows about 75 games / variants which have credit support (if enabled on dips), and unknown games are set to time based play. Switcher text is overlaid on the SNES output like a TV OSD, the picture is actually quite dim and I had to use a lot of boost to get a decent one. Time can be configured in 5,10,15 and 20 minute blocks per coin. The player can select game (if enabled, I’m still trying to establish exactly how the dips work for this) by holding button 3 and pushing the joystick left – there’s no instructions for this on screen and it took a while to find. It also appears to cycle through different games in attract for a couple of minutes each. For time based games the timer starts flashing as it’s about to expire and coins can be inserted to extend it. When the timer runs out the motherboard simply makes the SNES reset ending your game rather abruptly. 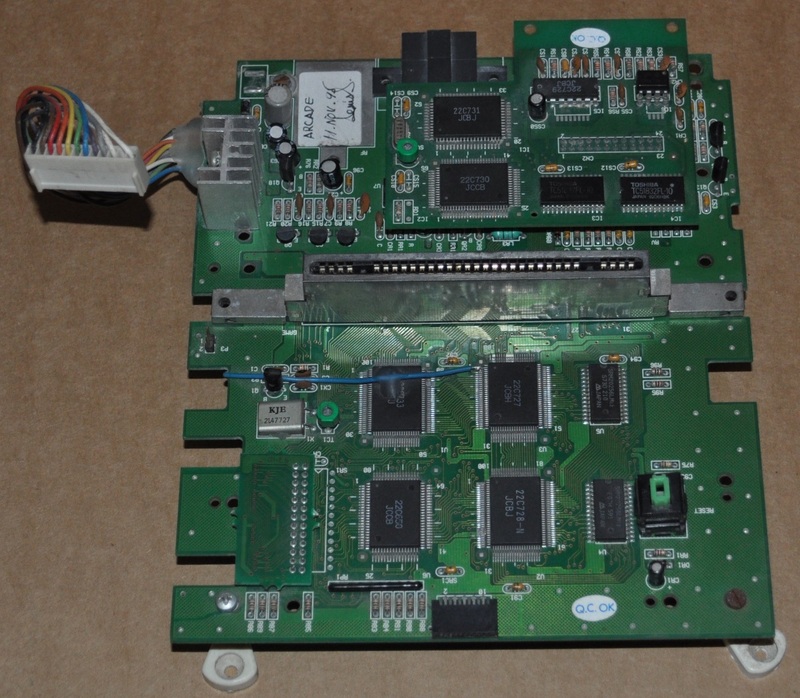 It’s quite interesting hardware – similar to the Tourvision an actual console motherboard is used (in this case a bootleg SNES) and the main board is a cart switcher and coin control/automation system. 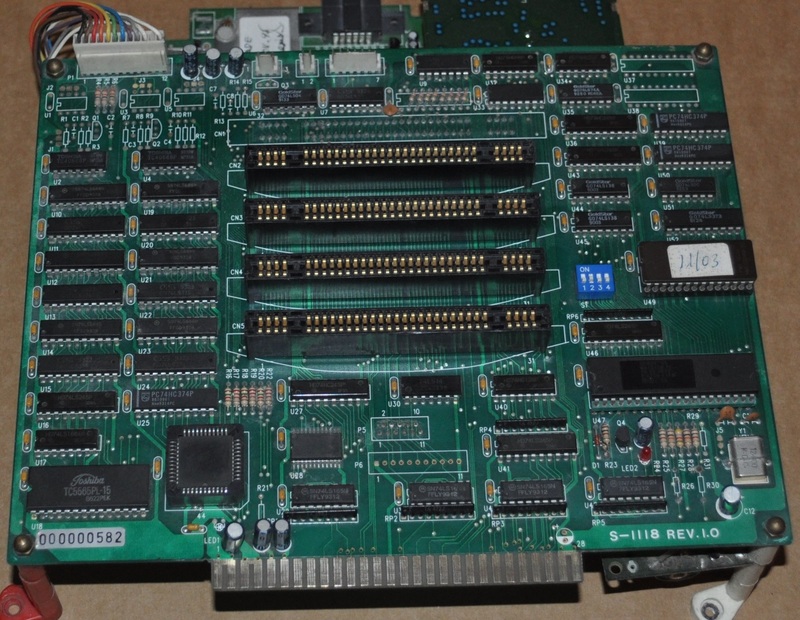 Here’s the top board, the slot furthest away from the JAMMA connector is the first cart slot. There’s a WD1016D-PL near it, I’m not able to find out what this chip is yet, and the quad which is probably the CPU has had any markings removed.. It’s likely built in Korea or China based on the number of Goldstar chips. Note the amplifier hacked onto the board, pretty sure this is non standard and the intention was to use this in a amplified cabinet. 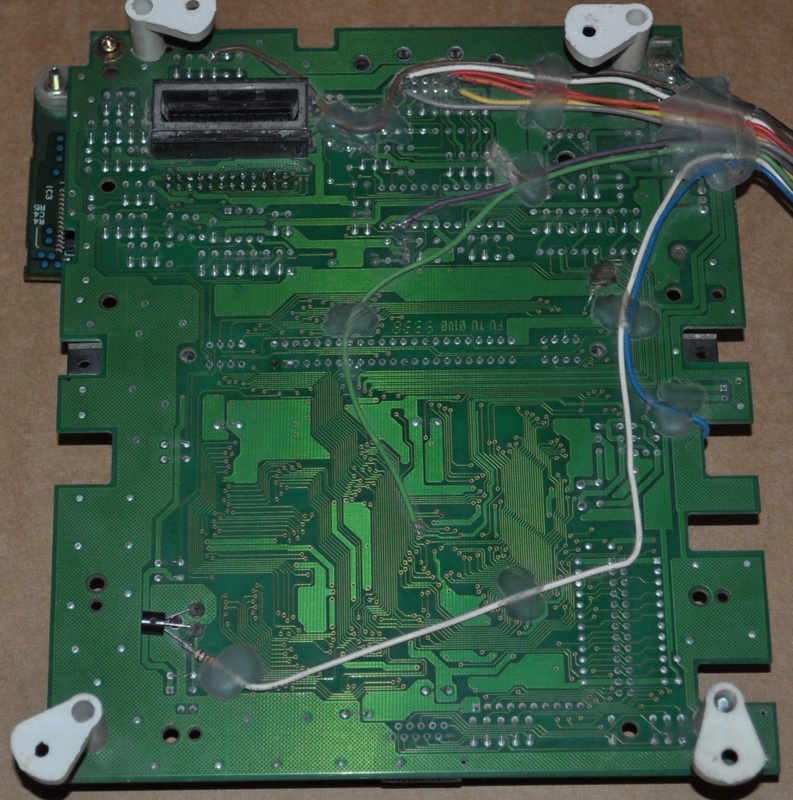 In a rather ugly fashion the switcher hooks up to this bootleg SNES motherboard, it appears to be regionless and is near enough a 1:1 clone – wires directly solder to various points under the motherboard to tap audio & video, and the small ribbon at the front appears to supply control inputs. I did have one problem with this, aside from constant issues with poor connection on the cart slot joiner – only one or two carts would boot at all, and they’d freeze. Pasky helped me out here by suggesting the sound module may have failed – he was right. 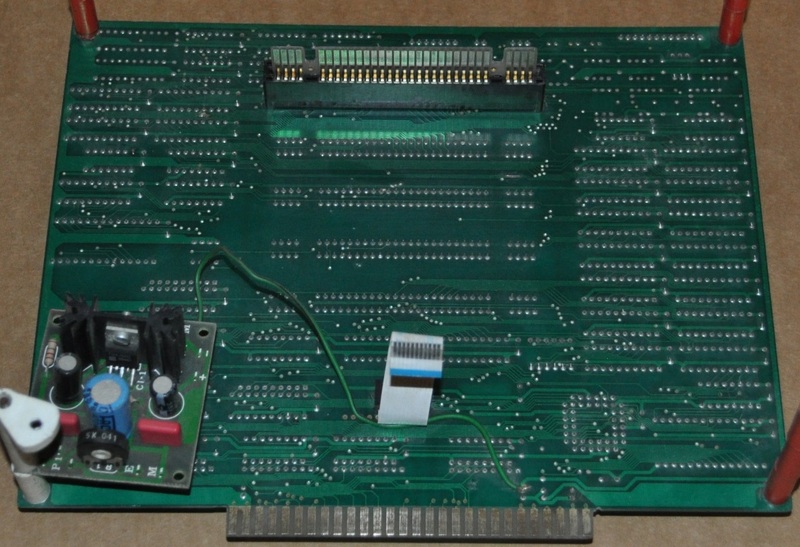 Here’s the bootleg sound module which I hope to repair in the future – someone has previously “repaired” it with the skill of an enraged babboon, I’m guessing one of the RAM chips is dead. Fortunately the clone is so close to real SNES hardware that I was able to use an original sound module, pinout is identical but the connector type is different, so for now I’ve soldered a ribbon in. The pinout is mostly JAMMA with extra inputs to support all the buttons on a SNES pad, it’s a shame it doesn’t map the buttons in a more useful fashion – for example Final Fight II uses JAMMA buttons 2 & 4 (which isn’t really standard either). The bank of four dip switches I’m still working on – I need 4x recognised games to proceed further with testing, the third switch is mysterious and the only effect I’ve seen so far is that the button 3 + left game switch no longer works, it’s possible this is on purpose and game switching might also be controlled by one of the unknown pin headers on the top board. Perhaps the intention was to have a game switch only accessible by the operator. I’ve also been looking through the BIOS data, it’s clear the system knows when to lock out the start button, there are some structures which look like they could be data tables which I haven’t managed to decipher yet – however I have identified two of them so far. The first is a list of games at address 1D86h which are 17 bytes long and contain an initial 0 and then 16 bytes of text which match the actual internal ROM name in a SNES cart at 7FC0h. The first entry is empty and appears to be used when no further entry matches. Some of these strings result in unprintable text which explains the next block. More information as/if I manage to work it out! An interesting system, makes me appreciate the design of the Tourvision more, this one design wise is profoundly ugly.